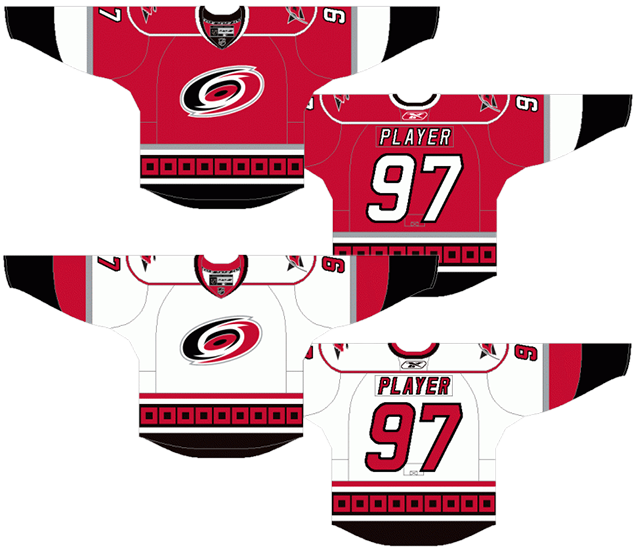 This installment of the Worst to First Jerseys features the Carolina Hurricanes. 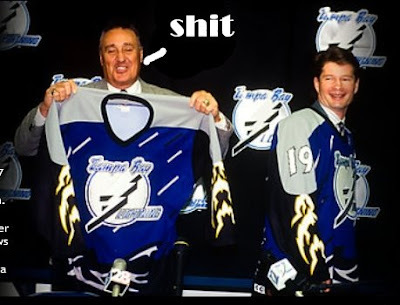 Worst to First Jerseys is an on-going series, covering all the jerseys worn by all the teams in the NHL. To see which teams we’ve covered, click here. If the team you’re looking for isn’t there…don’t worry, we’ll get there! The Hurricane franchise, considering that it’s spanned over 35 years and two cities, has stayed impressively consistent with their jerseys. 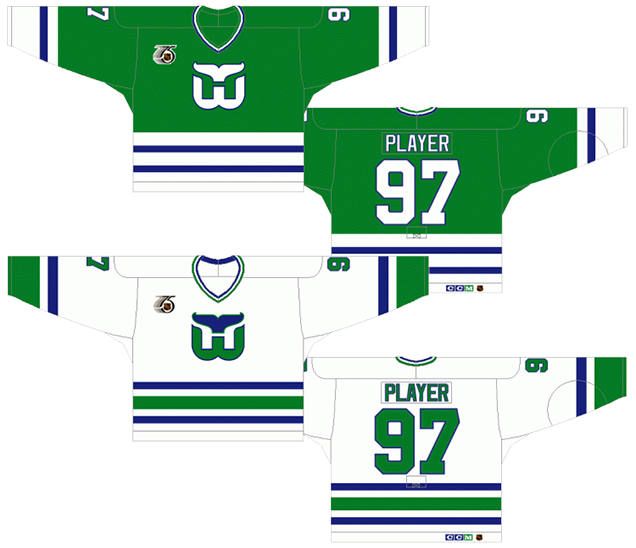 Of course, the move from Hartford to Carolina spawned a complete re-brand, but on both sides of that 1997 move, there’s only been two different jersey set (not counting the Whalers’ WHA days – which we’re not). Contrast that with a team like Pittsburgh, who had over a dozen different jersey sets in their first 35 years. The ‘Canes/Whalers have all mostly had good jerseys, but of course, someone’s gotta come in last and first. 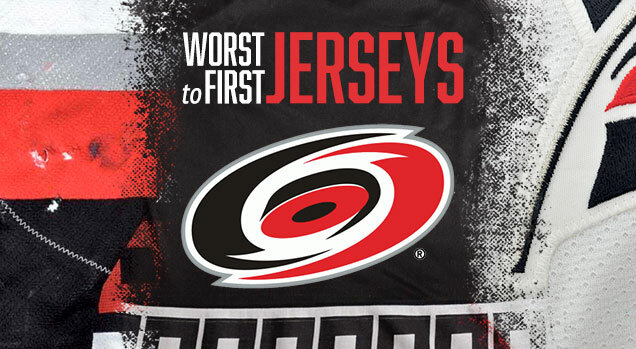 Here’s how this works: I’ll count down, from worst to first, all the jerseys the Hurricanes have ever worn (including covering the franchise’s Hartford days). Homes and aways will be lumped into the same category (so, more of a jersey “era”) and I won’t worry about small changes (like slightly changed positions of piping for example). Third jerseys will stand on their own. And I’m focusing on the jerseys only, not the entire uniform. 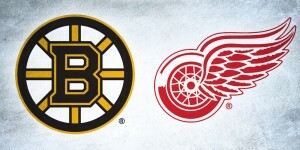 The jersey images are compliments of Chris Creamer and the fine people over at SportsLogos.net. For the ‘Canes/Whalers, there’s 5 different jerseys/eras. And we’ll start with the worst one. 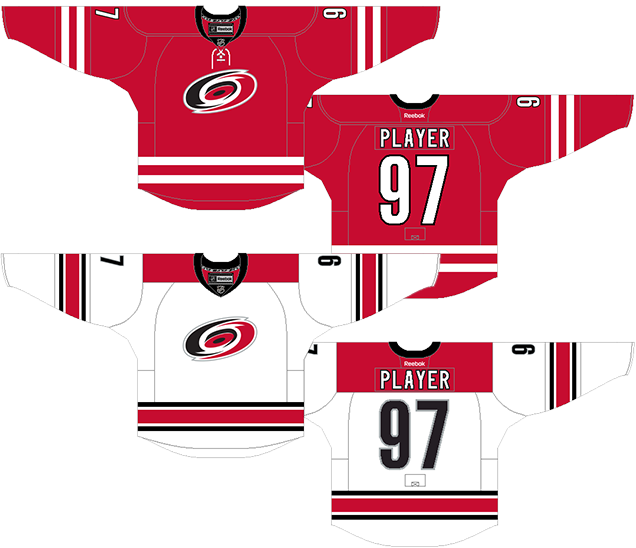 In their history, the Carolina franchise has only ever had one third jersey, and while it shows a lot more restraint than almost all the other third jerseys worn in the league (I’m looking at you Anaheim, Boston, Los Angeles, etc, etc, etc), it’s still not a great jersey. Like an average character in a great ensemble cast, it can’t keep up with the rest of the jerseys that the franchise has worn. Some of that stems from a person bias I have against black jerseys, that has been well documented on this site. When the other team is wearing white and you’re playing on a white sheet of ice, having black jerseys makes the game visually uninteresting and feels like a missed opportunity. With the minimal amounts of red, on top of adding the monochromatic grey and removing the colour from the logo on the shoulder patches, it makes for a jersey that doesn’t have a ton of impact on the ice. 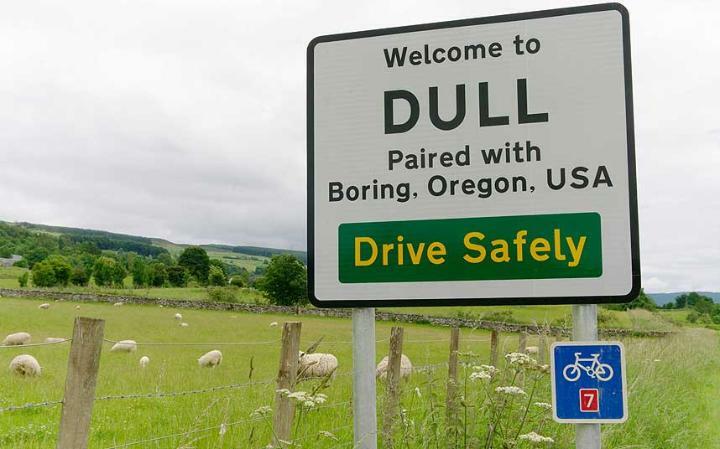 And the whole design is almost bordering on dull, like this sign. The most prominent remaining feature – the hurricane-symbol pattern along the bottom of the jersey (which we’ll talk about more later) – is a mixed blessing. 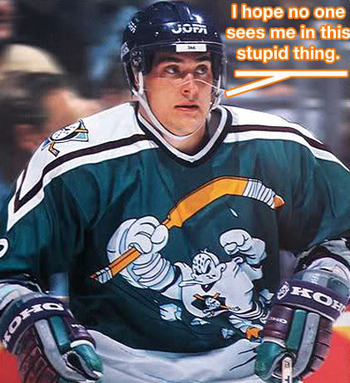 On the plus side, it’s the most interesting design element on a pretty simple jersey. On the negative side…it’s the most interesting design element on a pretty simple jersey, making it obnoxiously standout from the rest of the jersey. They toned down the contrast by making it grey on black, but yeah, doesn’t help. But, there are some decent qualities to this jersey – a simple striping pattern to the sleeves and collar, a good alternate logo that is made for a third jersey – that keep it from being a total tire fire. But not enough to keep it out of last place on this list. Jersey Recommendation: #26 Cole. Eric Cole joined the team during the same season these jerseys were introduced, and lasted in Carolina for another two seasons, which is about the life span this jersey should have had. But at least those were two of his best seasons in the league. You know when someone takes a movie and decides that, even though it’s still considered a great classic that still holds up, it should be revamped for a new generation only to fail miserably? Yeah, you know. 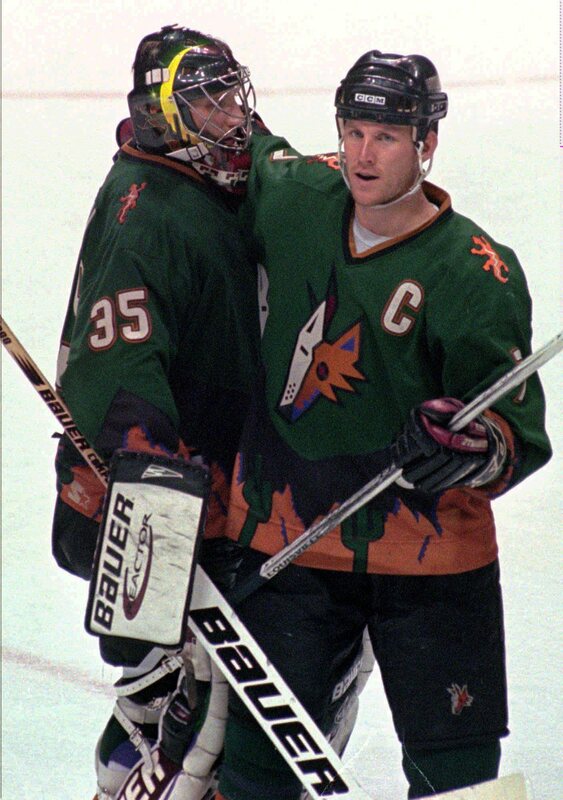 These jerseys are the hockey equivalent. 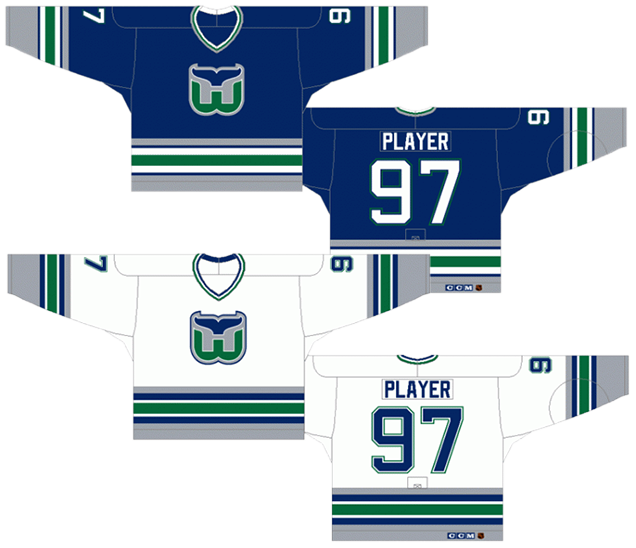 The original Whalers jerseys (which we’ll get to later) were neither dated nor badly-designed, so the decision to introduce new ones in 1992 seemed like an exercise in futility. They would never be loved nor revered in the same way as the originals, and they would signal the beginning of the end for the franchise in Hartford. These jerseys never saw a single playoff game in their 5 years of existence. And the playoffs are better off for it. First of all, the outlined-Whalers logo set on a grey background is totally unnecessary. And it’s outlined twice on the white jerseys: once is white around the logo, and then the grey is outlined in blue. 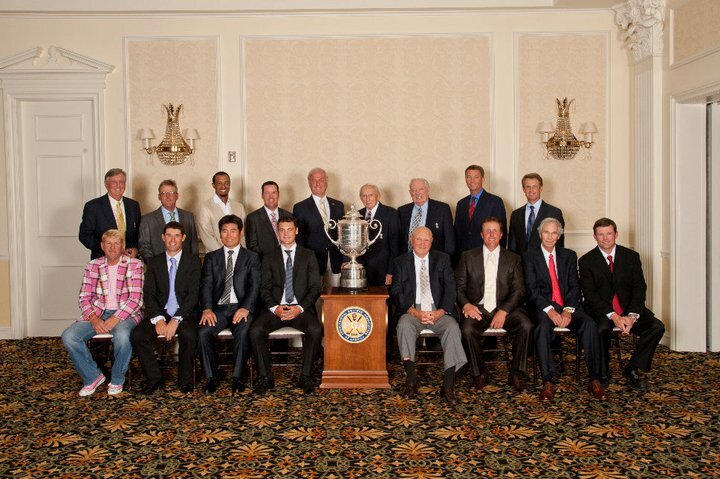 Second, while the stripes on the sleeves and bottoms are admirably consistent, do we really need seven of them? 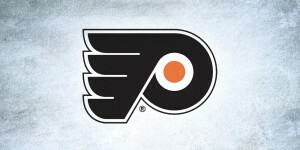 And why was the pattern changed between the home and away jerseys, with the lines having subtly different thicknesses? And why are those changes so subtle? It just feels all so unnecessary. Third, three stripes on the collar? Really? On top of all the other stripes? Feels like Oprah’s getting to give some of those stripes away. It just feels all so unnecessary, considering the jerseys that preceded them. Jersey Recommendation: #1 Burke. Sean Burke arrived in Hartford in 1992 and left in the middle of the first season in Carolina in 1998, so his span with the franchise matches up with these jerseys almost perfectly. And really, there weren’t many other prolific players with Hartford during this era. 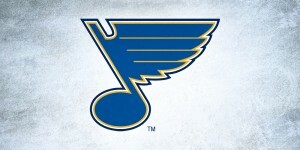 Get it in the blues. The original Carolina jersey set takes the next spot, Which is either third-best or third worst, depending on your personality. There’s a few interesting features on this jersey that makes it stand out. The first is the there-but-not-there shoulder yokes. The second feature is the hurricane-symboled stripe along the bottom. It works better here than on the black third jerseys because there’s less contrast between the red and black, so it doesn’t stick out quite so much. But, it would have been better had it been even more subtle – smaller symbols, or a dark grey on black. While it’s a relevant symbol to use and simple enough that it works in this way, it still commands too much attention. But hey, it’s not like the ’90s were known for subtlety. And it takes away from what should be the main focus of the jersey: the logo, which makes its appearance for the first time on this list. While it’s been much-maligned as a toilet bowl, it’s definitely not terrible. The rest of the jersey is a mixed bag. There’s inconsistent striping, but there’s a simple and solid colour palette. With all this combined, the middle is the best place for this jersey. Jersey Recommendation: #17 Brind’Amour. Oh captain, my captain. He’s maybe not the most prolific hockey player to don the jersey, but any captain that leads his team to a Stanley Cup can never be a bad choice. Get it in the pre-2007 reds. 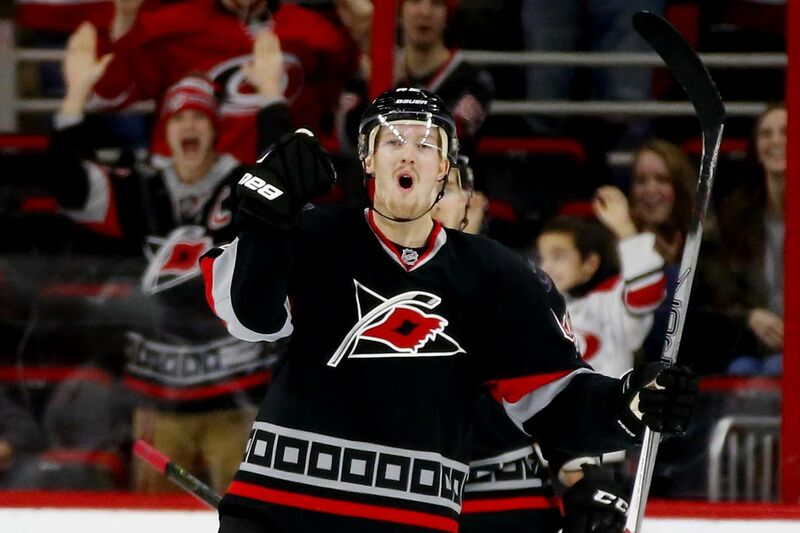 The current ‘Canes threads are no question an improvement on their previous ones. At the same time, it feels like they simplified a little bit too much from their previous jerseys. 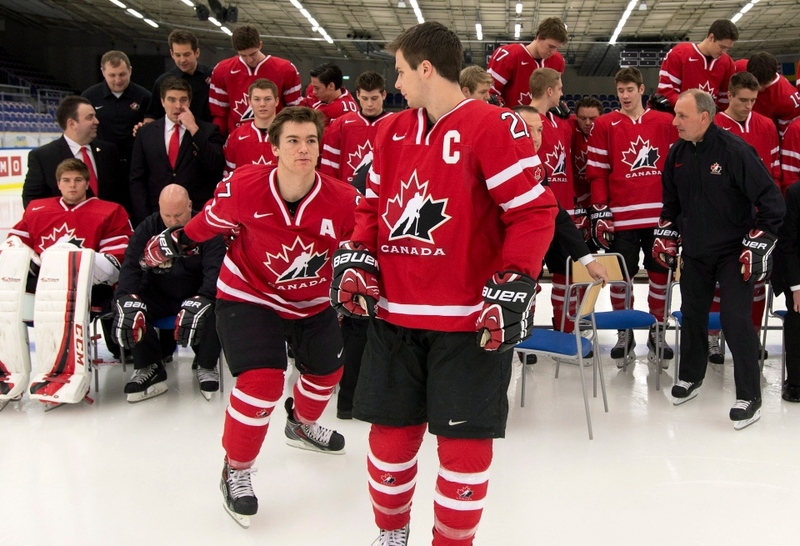 These have taken a page from Team Canada’s jersey handbook (which, for the record, I really don’t see as a problem), with the simple and elegant full red home jerseys and slightly more complex road white jerseys. 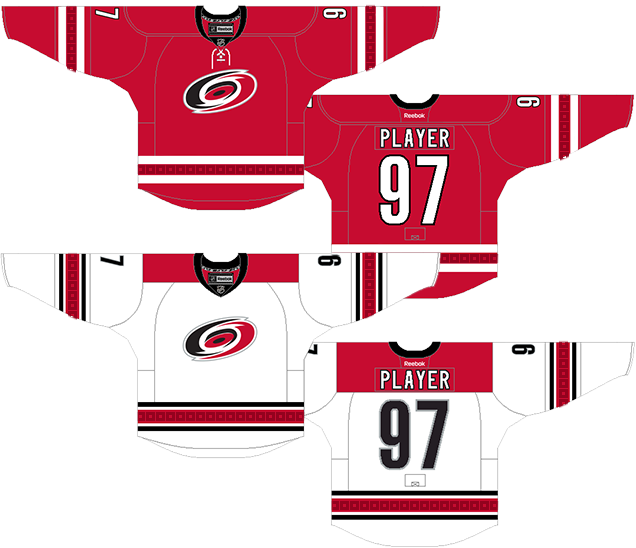 The grey from the previous jerseys is dropped completely, as is the hurricane-symboled striping. Don’t get me wrong, these are really classic and elegant jerseys and they look great on the ice. But, it feels slightly like a missed opportunity to form some continuity with the franchise’s visual history. I mentioned earlier that the hurricane-symbol pattern just needed to be more subtle, and that could work perfectly here. It’s just something a little bit extra to give the jersey more personality. 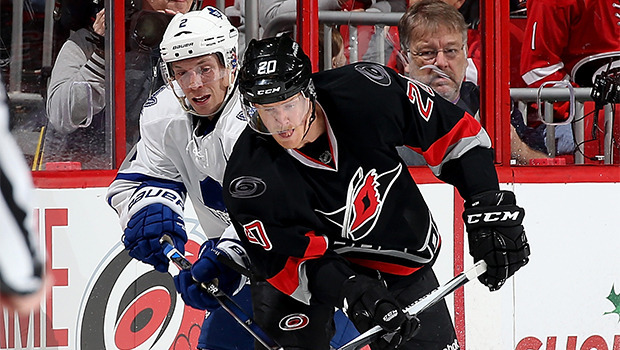 The striping on both jerseys are classic. 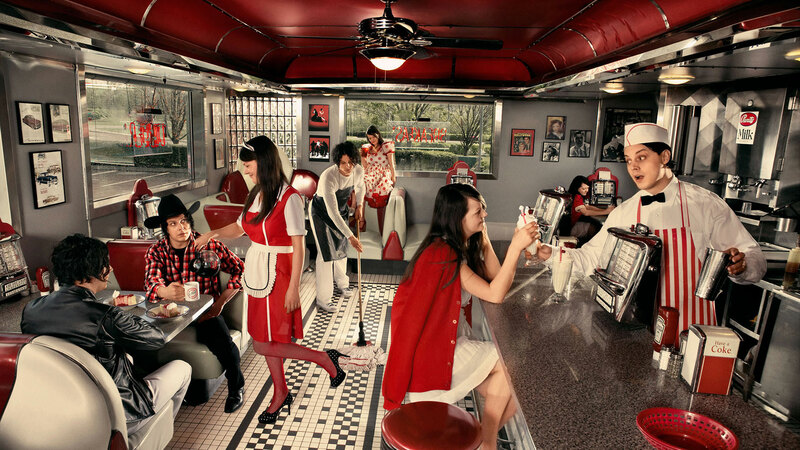 The double white stripes on the home reds are simple and elegant. The triple stripes on the road whites are classic and traditional. No complaints at all there. The shoulder yoke on the road whites are more contemporary, with them being blocked off with hard corners instead of the usual curved edge. And the typography on these jersey are more modern as well. Overall, it gives both a contemporary and classic look at the same time. They’re great jerseys, but it just feels like they need something slightly more. Jersey Recommendation: #31 Lack. I like goalies, and I love eccentric goalies, and this guy’s awesome. His love of tacos is legendary and his mask is on point. And that love affair with Luongo? Awesome. I don’t care how long he lasts in Carolina, or even if he ever becomes the #1 goalie. This dude deserves some celebration. Get it in the whites. Sorry ‘Canes fans. The top spot for your franchise’s jerseys belongs to Hartford. It’s hard to beat these legends of jersey lore. Green is the most tragically under-utilized colour in jersey design, and these jerseys are an excellent example of just how great it can look. Mixed simply with a royal blue, it’s striking and unique to the league, even today. The striping is classic hockey-jersey striping. While it’s not completely consistent from the sleeves to the bottoms (or from the white to green jerseys), it consistent enough that it doesn’t look out of place but still be visually interesting. Throughout this era, they had a few different variations, like angled sleeve stripes (1979–89, 1990–91), or the green added below the white/blue striping (1979–85), but they stayed mostly consistent. Consistently on point. Consistently awesome. And that earns it the top spot on this list. Jersey Recommendation: #10 Francis. Who else? Former Whaler, former Hurricane, current Hurricane GM. Aside from a (moderately successful) stint with Pittsburgh, this guy has been the face of the franchise through three generations. He bleeds red and black…and blue…and green. He bleeds rainbows basically. Get it in the awesome green jersey.